Ranger Boats is introducing a new line of pontoon boats for 2017 called Reata by Ranger. The fish models feature aerated live wells, Lowrance Hook 5 electronics and rod storage and are pre-wired for the installation of trolling motors available from Minn Kota and Motorguide. Ranger Boats is introducing a new line of pontoon boats for 2017 called Reata by Ranger, which will consist of three fish models and four cruise models. The line pulls from Ranger’s Reata series of fish-and-play designs. 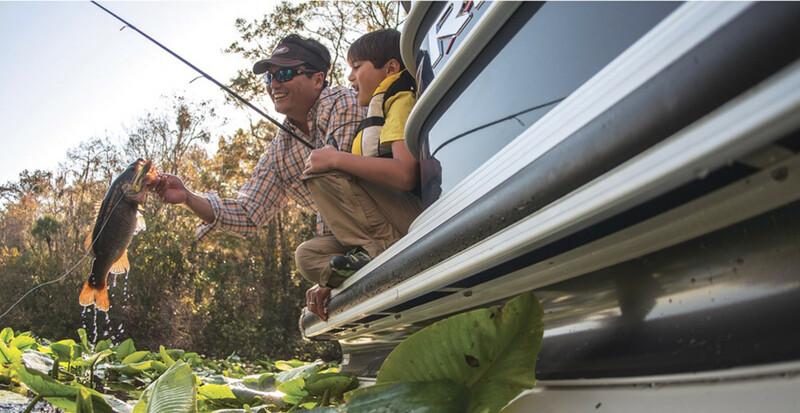 "With so much versatility and comfort, we&apos;ve seen the pontoon segment attract more and more families each year," Ranger Boats product development director Lance Newton said in a statement. "We&apos;re excited to offer these customers a product paired with the same craftsmanship and attention to detail we put in all Ranger designs, as well as the long list of 5-Star advantages that come with it." The three fish models are the 200F, 220F and 223F; the four cruise models are the 200C, 220C, 223C and 243C. Both series include triple-tube models with 26-inch diameter logs, complete with lifting strakes. Amenities include powder-coated pontoon logs, premium vinyl flooring, fiberglass consoles, automotive-inspired dash designs and fully wrapped custom upholstery. All models also feature wheelchair-accessible interior swinging gates, phone management systems and thicker, extended side panels. The fish models feature aerated live wells, Lowrance Hook 5 electronics and rod storage and are pre-wired for the installation of trolling motors available from Minn Kota and Motorguide. A fishing station with tool and rod holders, a lockable 7-foot, 6-inch rod box with organizer and multiple live wells are also available, depending upon the model. The cruise models sport full-width swim platforms, storage, custom upholstery, a stowable changing enclosure, LED lighting throughout and port and starboard bow lounges. The cruise models sport full-width swim platforms, storage, custom upholstery, a stowable changing enclosure, LED lighting throughout, port and starboard bow lounges, a stowable table, 12V and USB outlets, a Kicker stereo with Bluetooth input and built-in LED navigation lights and docking lights. Each Reata by Ranger model is available with the choice of a factory-rigged Mercury, Evinrude or Yamaha outboard and comes in several color packages.